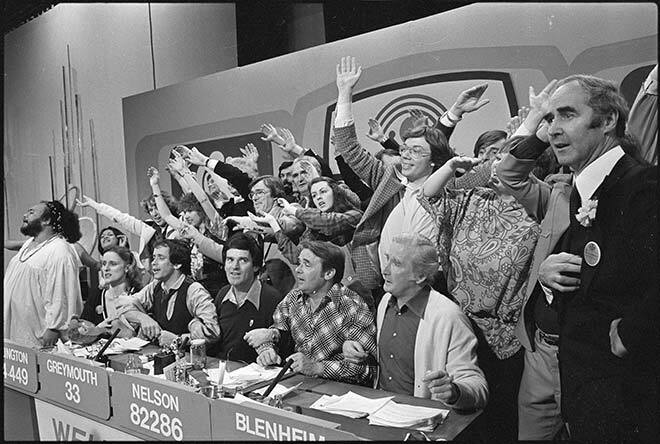 One notable success of the second channel, South Pacific Television or TV2, was Telethon, when television personalities worked to raise money over 24 hours for a good cause. This is the final stages of the 1979 telethon,which raised $2,767,351 for the Year of the Child. Prominent personalities of the time are visible. In the front row (from left) are Dalvanius Prime (singer), Alex Wiltshire (pianist), Ray Columbus (singer), John MacNally (singer), Jack Smethurst (actor), Philip Sherry (newsreader) and, standing, Hugh Templeton (minister of broadcasting). In the next row are (from left) Relda Familton, with arms outstretched (reporter), Sharon O'Neill (singer), Jim Healy and Maree McKeefry (both Close to home actors), Bob Parker (presenter) and Ann Pacey (singer), partly obscured.